Jatin Das, a contemporary artist and has been painting for 50 years, has held over 55 one-man exhibitions both in India and abroad, and has participated in numerous national and international shows and artist camps. In 2012, he was conferred the Padma Bhushan, India's highest civilian award by the President of India on 22nd March 2012 at the Rashtrapati Bhawan. In a career spanning over five decades, his works have been part of several public and private collections in India and abroad. Most notably, he has done several murals and sculpture installations, including a 67' x 7' large mural at the Parliament House entitled "Mohenjodaro to Mahatma Gandhi", commissioned by the Parliament of India on the occasion of 50 years of India's Independence. 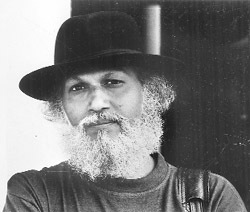 Jatin Das studied at the Sir JJ School of Art in Bombay. He primarily uses oil, watercolour, ink and conté. He has lectured extensively at innumerable art and architectural colleges and museums on contemporary and traditional art forms, and acts as an advisor to many government and private art and cultural bodies. In addition to charitable donations locally and internationally, the artist actively led the relief and rehabilitation work of a village in Orissa after the super cyclone in 1999. Over the last 45 years, Jatin Das has built a large personal collection of traditional arts, including a rare collection of over 6,500 hand fans that has been exhibited in India and abroad. The J D Centre of Arts has been established to house his collection of traditional and contemporary art in Orissa. JDCA, was registered as Trust in 1997, with Das as its Founder and Chairman, and is being designed by the eminent architect, B V Doshi. 28 years ago Jatin Das began a collection of pankha (hand fans). More than 6500 fans and related objects, a majority of which are from the Indian subcontinent. Since May 2004, the collection has been on display at eminent museums in India and overseas. The inaugural show at the National Crafts Museum, Delhi, was followed by exhibitions at the Victoria Memorial; Kolkata, Fan Museum; London; Reitberg Museum, Zurich; National Art Gallery; Kuala Lumpur; National Museum; Manila, Kennedy Centre, Washington DC, USA in 2011 The collection will eventually be housed in a National Pankha Museum in New Delhi. A book on the subject, ‘To Stir the Still Air', will be published by Mapin International. Postal stamps for Indian Postal Service on road safety, world peace and the Int'l Red Cross. Sir JJ School of Art, Bombay; 2007, 2010. Ambassador C & Binette, U.K.
best cima exam preparation can only be taken with lots of studies, memorizing capacity an understanding capability and most importantly lots of practice because we all know after all practice makes a man perfect.Learn before you make mistakes that can't be corrected. I am very happy to pass my CIMA and thankful to Dumpsprofessor. I was worried for my exam before I was told about CIMA Real Exam Dump. I secured scores more than my expectations because almost all the questions in the final test were familiar to me. I had practiced on testing engine which brought me near perfection. If I go for any certification in the future my definite selection will be Dumpsprofessor.us. Your work is really exceptional!